These custom crafted Lester Lampert original SkaLLop™ J-Hoop earrings are set in 18kt. 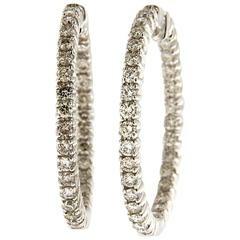 white gold with 20 ideal cut round diamonds= 2.02cts. t.w. (the diamonds are G in color and VS in clarity) Every Lester Lampert piece will arrive in an elegant custom jewelry box.